Antioxidants – Phytopath – This supplement contains substantial amounts of some of the best antioxidants substances available, including Oligomeric Proanthocyanidins (OPCs), and is especially important for people who don’t eat enough fruits and vegetables. Do you get enough fruits and vegetables in your diet? Free radicals are reactive molecules that “steal” electrons away from other molecules. Cells generate these radicals as a natural consequence of metabolic processes. The most common radicals produced in the human body are superoxide, an oxygen-centered radical with limited reactivity, and hydroxyl, a highly reactive oxygen-centered radical that attacks all molecules in the human body. These radicals cause damage to the molecular components of cells, particularly the lipids that make up the cell membrane. They can also cause damage to the molecular structure of DNA. The body can also be exposed to free radicals generated in the environment. Fortunately, natural antioxidant systems have evolved in the body that help minimize the potential damage caused by free radicals. These antioxidant systems neutralize free radicals by donating their electrons to the radicals, thus eliminating the need for molecules important in cellular structure and function to become involved. Q. 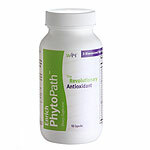 Why is PhytoPath a better product than any other pycnogenol product? A. PhytoPath contains not only grape seed extract but it also contains maritime bark extract along with vitamin A, vitamin C, green tea extract, polyphenols, and other specialty nutrients with antioxidant effects. Q. What is a polyphenol? A. Polyphenols are antioxidants that are plant substances, such as anthocyananins, flavonoids, and poranthocyanidins. Q. What are Oligomeric Proanthocyanidins (OPCs)? A. A powerful blend of botanical extracts (grape seed and maritime bark extract) called oligomeric proanthocyanidins. They support the skin and eyes and the metabolic systems in the body. Q. The PhytoPath contains green tea extract. Does caffeine occur naturally in the green tea? A. Yes, the Green tea contains a small amount of naturally occurring caffeine. Q. How much of the naturally occurring caffeine is found in the PhytoPath? A. Each capsule can contain approximately 6 mgs.